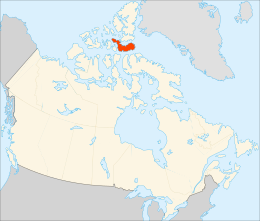 Devon Island (Inuit: Tatlurutit) is the largest uninhabited island on Earth. It is located in Baffin Bay, Qikiqtaaluk Region, Nunavut, Canada. 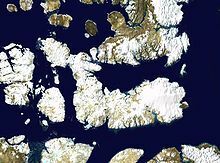 It is one of the larger members of the Canadian Arctic Archipelago, the second-largest of the Queen Elizabeth Islands, Canada’s sixth largest island, and the 27th-largest island in the world. It comprises 55,247 km2 (21,331 sq mi) (slightly smaller than Croatia) of Precambrian gneiss and Paleozoic siltstones and shales. The highest point is the Devon Ice Cap at 1,920 m (6,300 ft) which is part of the Arctic Cordillera. Devon Island contains several small mountain ranges, such as the Treuter Mountains, Haddington Range and the Cunningham Mountains. Robert Bylot and William Baffin were the first Europeans to sight the island in 1616. William Edward Parry charted its south coast in 1819-20, and named it North Devon, after Devon in England, a name which was changed to Devon Island by the end of the 1800s. In 1850 Edwin De Haven sailed up Wellington Channel and sighted the Grinnell Peninsula. An outpost was established at Dundas Harbour in 1924, and it was leased to Hudson’s Bay Company nine years later. The collapse of fur prices led to the dispersal of 53 Baffin Island Inuit families on the island in 1934. It was considered a disaster due to wind conditions and the much colder climate, and the Inuit chose to leave in 1936. Dundas Harbour was populated again in the late 1940s, but it was closed again in 1951. Only the ruins of a few buildings remain. 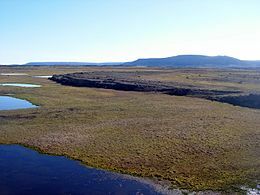 Because of its relatively high elevation and its extreme northern latitude, it supports only a meagre population of musk oxen and small birds and mammals; the island does support hypolith communities. Animal life is concentrated in the Truelove Lowland area of the island, which has a favourable microclimate and supports relatively lush Arctic vegetation. Temperatures during the brief (40 to 55 days) growing season seldom exceed 10 °C (50 °F), and in winter can plunge to as low as −50 °C (−58 °F). With a polar desert ecology, Devon Island receives very little precipitation. Cape Liddon is an Important Bird Area (IBA) notable for its black guillemot and northern fulmar populations. Cape Vera, another IBA site, is also noted for its northern fulmar population. Devon Island is also notable for the presence of the Haughton impact crater, created some 39 million years ago when a meteorite about 2 km (1.2 mi) in diameter crashed into what were then forests. The impact left a crater about 23 km (14 mi) in diameter, which was a lake for several million years. The Devon Island Research Station was established in 1960 and it is maintained by the Arctic Institute of North America. It is located in Truelove Lowland, on the northeast coast of Devon Island (75°40′N 84°35′W). The Flashline Mars Arctic Research Station project entered its third season in 2004. 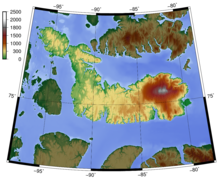 In July 2004, Devon Island became the temporary home for five scientists and two journalists, who were to use the Mars-like environment to simulate living and working on the Red Planet. April 2007 through 21 August 2007 was the longest simulation period and included 20 scientific studies. 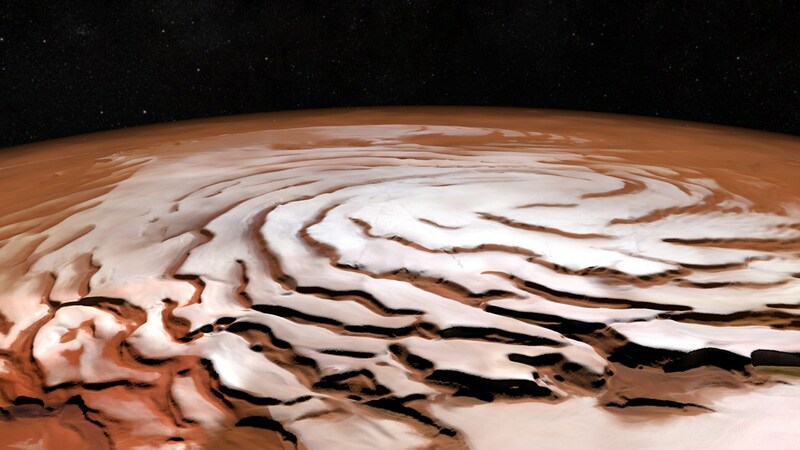 The Haughton crater is now considered one of Earth’s best Mars analog sites. It is the summer home to a complementary scientific program, NASA‘s Haughton Mars Project. HMP has conducted geological, hydrological, botanical, and microbiological studies in this harsh environment since 1997. HMP-2008 is the twelfth field season at Devon Island. In 2007, fossils of the seal ancestor Puijila darwini were found on the island. On July 16, 2013, the Canadian Space Agency assigned Canadian astronaut Jeremy Hansen to a secondment with the Centre for Planetary Science and Exploration of the University of Western Ontario at Haughton Crater in preparation for a potential future manned exploration of Mars, the Moon or the asteroids. Markham, Clements (1881). The voyages of William Baffin, 1612-1622. London: Hakluyt Society. Parry, William Edward (1821). Journal of a voyage for the discovery of a North-West passage from the Atlantic to the Pacific: performed in the years 1819-20. London: John Murray. kuschk. “Devon Island: The Largest Uninhabited Island on Earth”. Retrieved 27 February 2014. Savours, Ann (1999). The Search for the North West Passage. New York: St. Marten’s Press. “Cape Liddon”. bsc-eoc.org. Retrieved 2009-04-23. “Cape Vera”. bsc-eoc.org. Archived from the original on 2011-06-12. Retrieved 2009-05-04. Aggerholm, Barbara (2007-08-22). “Looks like Mars, feels like Mars”. The Record. Retrieved 2008-05-06. Desportes, C.; Rice, M.; Lee, P. (2007). “Periglacial polygon fields on Devon Island, High Arctic” (PDF). Lunar and Planetary Science XXXVIII. Retrieved 2008-05-06. “Gearing up for the 12th Year of Research at Haughton Crater”. Mars Institute. 2008-02-23. Retrieved 2008-05-06. Black, Richard (2009-04-22). “‘Missing link’ fossil seal walked”. BBC Online. Retrieved 2010-11-13. Anderson, David G, and L C Bliss. 1998. “Association of Plant Distribution Patterns and Microenvironments on Patterned Ground in a Polar Desert, Devon Island, N.W.T., Canada”. Arctic and Alpine Research. 30, no. 2: 97. Cockell, Charles S, Pascal Lee, Andrew C Schuerger, Loretta Hidalgo, Jeff A Jones, and M Dale Stokes. 2001. “Microbiology and Vegetation of Micro-Oases and Polar Desert, Haughton Impact Crater, Devon Island, Nunavut, Canada”. Arctic, Antarctic, and Alpine Research. 33, no. 3: 306. Lamoureux, Scott F, and Robert Gilbert. 2004. “A 750-Yr Record of Autumn Snowfall and Temperature Variability and Winter Storminess Recorded in the Varved Sediments of Bear Lake, Devon Island, Arctic Canada”. Quaternary Research. 61, no. 2: 134. Paterson, W. S. B. “An Oxygen-Isotope Climate Record from the Devon Island Ice Cap, Arctic Canada”. Nature, Vol.266,No.5602. 1977. Robertson, Peter, and G. D. Mason. Shatter Cones from Haughton Dome, Devon Island, Canada. 1975. Ugolini, Fiorenzo C, Giuseppe Corti, and Giacomo Certini. 2007. 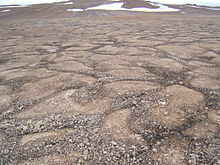 “Pedogenesis in the Sorted Patterned Ground of Devon Plateau, Devon Island, Nunavut, Canada”. Geoderma. 136, no. 1: 87. To enjoy more great articles and get the latest from Business Insider, follow us on Facebook or Twitter and subscribe to our Newsletters. You can also enjoy the Business Insider app on your mobile device. Download it now for iOS or Android. This clock looks cool on an desk or table and makes a great conversation piece. Can be powered by a USB connection from a computer, USB hub or even a USB charger! The time is set with a simple on-board touch sensor. Everything you need to build your own working Mars time binary clock! Touch the sensor for 2-5 seconds to synchronize the clock to the nearest minute (forwards and backwards in time). Touch the sensor for more than 5 seconds and the time will advance, first through the minutes, then through the hours. The Westly Foundation is seeking entrepreneurial changemakers to apply for the Westly Prize for Young Innovators of California, which will award $25,000 cash prizes to innovators under age 28 with novel solutions to community challenges at home or around the world. Innovations must be prototyped and scaleable, and the innovators must live, work, or attend school in California, or have a residence in California but attend school elsewhere. Non-profit, for-profit, or hybrid ventures are eligible, provided they evidence a strong social mission. Students as young as high school are encouraged to apply. Applications are due October 15, 2017, and winners are selected following a Demo Day for finalists on January 20, 2018 in Silicon Valley. Learn more here.